DLC for Valve's portal-based puzzler is out of beta and releasing on time - October 4, to be exact. If you've been sitting motionless in front of your TV ever since you finished the Portal 2 co-op campaign, you probably should have played something else in the meantime. For the rest of you, you'll be pleased to know that the long-awaited DLC pack for the game is coming your way October 4th. The update will be available through Steam, Xbox Live Marketplace, and PSN, and best of all, it will be free on all platforms. 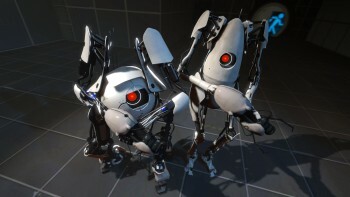 While the DLC pack won't expand Chell's single-player adventure, it will add "Peer Review," a whole new cooperative campaign for robot pals P-Body and Atlas. Details are scarce about the new mission, except that players will "once again match wits with GLaDOS," the nefarious, off-kilter AI. The DLC will also introduce a "Challenge Mode" for both single-player and co-op play. Players will be able to compete for the best scores and then compare their rankings on Leaderboards. Valve recommends visiting the game's website for 24 new tracks from the Portal 2 score if you simply can't wait four more days. In the meantime, I've experiments to run and there's research to be done, so I'd better finish it all before the DLC hits.